Clare will face Kerry in their Munster SFC semi-final for their third straight year. 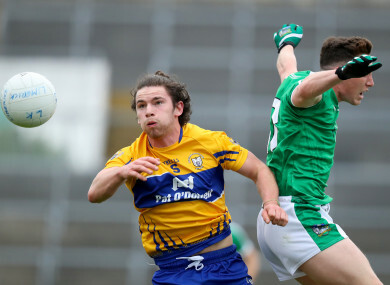 LIMERICK WERE DENIED a first Munster championship win since 2012 as Clare eased their way into the provincial semi-final with Kerry in two weeks’ time. This was a convincing win for the Banner men who showed the gulf between the sides as Colm Collins’s troops now head for Killarney and a semi-final clash with Eamonn Fitzmaurice’s Kerry for the third straight year. Kieran Malone impressed up front for Clare with a 1-3 tally, while the defence was well marshalled by Aaron Fitzgerald and Cillian Brennan and Clare ran out easy winners. Eoin Cleary curled over a lovely score after three minutes to start the scoring, and his forward colleagues Keelan Sexton and David Tubridy soon matched his tally to make it 0-3 to 0-0 after five minutes. A foul on Jamie Lee allowed Sean McSweeney to get Limerick on the board, but Clare’s response was emphatic as Pearse Lillis, Jamie Malone and Cleary all found the target again – and only a great save from O’Sullivan denied Kieran Malone a goal. But the Limerick defence was being carved open too easily, and after 18 minutes Kieran Malone exchanged passes with Jamie Malone, and Kieran round the net after his initial effort was well saved by O’Sullivan. With Gary Brennan and Cathal O’Connor in control at midfield Clare were well on top at that stage, but to their credit Limerick responded with a couple of good scores as Jamie Lee and Danny Neville hit a couple of scores to trim the gap to six points. A third Cleary score looked to have restored the natural order of the half nine minutes from the break, but with Lee and Neville instrumental, Limerick kept in touch. A free from McSweeney saw them hit back straight away, before Lee and Neville pointed again, which was followed by a great Paul White score to put a goal between the sides after 28 minutes. A great stop from Eamonn Tubridy halted Limerick’s run five minutes from the break, as points from Kieran Malone and David Tubridy, put Clare 1-9 to 0-7 ahead at half-time. A foul and some dissent from Eoghan Collins allowed Lee to close the gap to four points early in the second-half, and by the 40thminute McSweeney pointed to put just a goal between the sides. But Clare finally found their feet again after 13 barren minutes. Eimhin Courtney landed a great score, which was followed by four more unanswered points for Clare, with two of them coming from the boot of Cleary. From there to the end it was a canter for Clare as substitute Gearoid O’Brien and Kerian Malone pointed in a 12 point win. Scorers for Clare: Kieran Malone (1-3), Eoin Cleary (0-5), David Tubridy (0-3, 1f), Eimhin Courtney (0-2), Conor Finucane 0-2, Conal Ó nAinifein, Pearse Lillis, Cathal O’Connor, Keelan Sexton, Gearoid O’Brien, Gavin Cooney, Martin O’Leary, Jamie Malone (0-1 each). Scorers for Limerick: Sean McSweeney (0-5, 5f), Jamie Lee (0-3, 1f), Danny Neville (0-2), Josh Ryan (0-3, 2f), Paul White (0-1). Martin O’Leary for Courtney (67). Email “Clare safely book passage to Killarney with convincing win over Limerick”. Feedback on “Clare safely book passage to Killarney with convincing win over Limerick”.